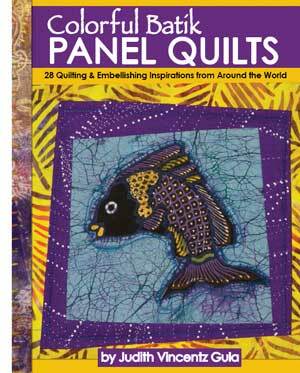 Colorful Batik Panel Quilts: 28 Quilting and Embellishing Inspirations from Around the World by Judy Gula is now in stock! Learn to make bold, graphic, and joyous art quilt projects and home décor using these hand-made batik panels, in traditional quilt settings or turning them into works of art with the addition of embellishment. Visit our YouTube channel to watch as Judy presents a beautiful array of art quilts created using these artisan batik panels — many of the quilts shown will be featured in her book. This video captures the introduction she gives to as she begins her batik panel quilt workshop, one of several options she teaches throughout the country — book Judy for your own group! The Batik Panels offered by Artistic Artifacts are the work of some of Indonesias finest batik artists and not only make uniquely attractive wall hangings, but lend themselves beautifully to use not just in quilts, but as pillows and table runners; wearable art such as jackets and vests — any form of fiber art. Due to their handcrafted nature, the Batik Panels offered here are each individual and unique; illustration photographs should be considered a guide or an overall representation of product being purchased. Artistic Artifactss customers should accept that variations will occur between the product photo and what is shipped, in particular with regard to batik paintings. Differences in the sketched outlines, fill patterns, dyes and more are common and are to be embraced — you will receive a one of a kind piece of art! A disclaimer regarding color — despite every effort to accurately duplicate each product’s color when photographed or scanned to our website, actual colors may vary. Due to monitor and/or video card differences, subtle variations in color and surface texture may not be fully revealed. The colors on your screen may not be an accurate depiction of the actual color. See our Terms and Conditions for additional information. Producing a high quality piece of batik fabric, such as the panels featured here, is time consuming and requires a high degree of skill. Tradition has it that each time the batik artisan executes a particular intricate pattern, the design is not only fixed to the cloth, but the meaning of the design is engraved ever more deeply in the soul of the artisan. Learn more about the process of creating batik fabric and paintings.